Tom and Rita Mahoney of Chelmsford, Massachusetts, are safe after Hurricane Irma turned their tropical St. Maarten vacation into a nightmare. 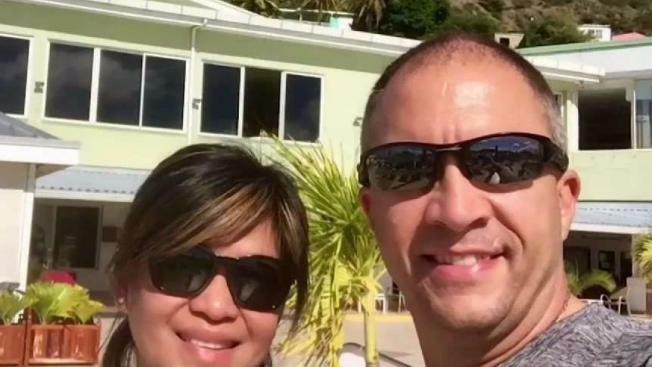 A couple from Chelmsford, Massachusetts, is safe after Hurricane Irma turned a tropical vacation to St. Maarten turned into a nightmare. Tom and Rita Mahoney had been looking forward to their stay at the Sonesta Great Bay, a trip the couple had planned to celebrate Rita's birthday. After enjoying a few days in paradise, they realized they would have to hunker down at the resort to ride out a hurricane. "The next thing we knew, it was a Cat. 5 with over 185 mph winds," Tom Mahoney said. "It became pretty real, really fast." The couple and roughly 50 other resort guests were told to grab their belongings from their rooms and get to the ballroom. It was said to be the safest place on the property — until part of the roof caved in. "It felt like the whole roof was lifting off the ground, and at that point, I didn't know if we were going to make it," Mahoney said. They ran to a stairwell at the hotel and put pillows over their heads as the eye of the storm passed right over them. "There was no opportunity for fear because it just wasn't expected," Rita Mahoney said. "It's something you would never imagine that you would go through." The horror did not end when the storm did. With no running water and hardly any food or power, they moved to a shelter before getting on a military plane to Puerto Rico days later. The couple credits the staff at the Sonesta with saving their lives. They wanted to share their story to get the word out that plenty of people are still on the devastated island of St. Maarten and in need of help. "We're very thankful and grateful, but it's a very hard experience," Tom Mahoney said. "I think we'll carry it with us forever."